You’ll hear that a lot around here, whether you’re learning to trot or practicing canter departures or entering the show ring for the first time....or the 100th time. At Turning Point , riders of all ages and levels discover that responsibility is fun. Determination ultimately takes home more ribbons than talent. And win or lose, the real joy is in the trying. 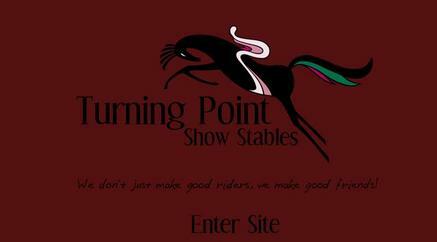 Meet Sheryl MacLeod, owner and trainer at Turning Point Show Stables. Sheryl is a highly regarded hunter and equitation trainer with more than 25 years experience. She has coached many of her students to wins at the top local, 'A' rated and National rated horse shows. Whether you are new to the world of horses or have been riding and showing for years, we can help you achieve your goals. We offer lessons, showing, sales, leases and partial leases. For some riders, showing and competing in the hunter ring is their main focus. For others, it is experiencing the joy of being around the horses for a weekly lesson. Either way, we don’t just make good riders, we make good friends too! Here is a chance to get to know us a little better.